Many people come to me with questions about the PMP application process. These questions can range from the the very basic ones, to ones which require quite a bit of explanation. I have attempted some simpler ones here. If you have any other questions, let me know and I’ll add them here, or in a subsequent post. How long does it take to apply for the exam? Will my application be audited by PMI? How is PMI going to audit my application? My designation is not Project Manager? Can I still apply? How to document the experience? How long does it take to apply for the exam?The PMP Exam application process is not very complex. Simply log on to the PMI website at http://www.pmi.org and create a login for yourself. Click on the Log In button on the far right top corner. Then click on Register Nowto create a new id. There is no charge to create this id.Infact, you do not need to be a PMI member to apply for the PMP exam.Although PMI encourages you to become one. They offer a discount in the exam fee, if you become a member of PMI. The PMI me mbership fee + the discounted exam fee is slightly cheaper than the full exam fee for non members. Even at a $5 discount, you are still better off with a PMI membership.The application process is fairly simple. It is all online, but it takes atlesat 3-4 hours to fill the form. And if you do not have the details of the number of hours worked on each process for each project, it will most likely take even longer. I have heard of people trying to get the application completed, and after spending 3-4 days, they kind of give up.So it is better to calculate your hours per process and for each project on a Excel spreadsheet, or a piece of paper, and then attempt the online application process. This saves considerable time and you can be done in 3-4 hours flat.Once you submit your application, PMI will approve it usually within 1 week or 5 business days.Most people just get the email confirmation of the approval from PMI. Will my application be audited by PMI? PMI does a random audit of all applications. This means that only about 1-2% of applications get selected for audit. So do not worry too much about it. Of course, in the event that your application gets selected for audit, do not panic. Print out the audit package, and go through the steps of obtaining the necessary signatures from your clients or customers whom you have listed for each project, one by one. How is PMI going to audit my application?PMI does not call your clients or company directly to audit your application. In fact, you need to print out your application form from the audit package, and go to the client contacts and get their signatures. All work has to be done by you, and then mail all the hard copy signature forms to PMI in the USA, by post. I am not in touch with my past company or colleagues, or the project was done in another country. How does PMI audit in this case?As far as I understand, you can get other project managers in the same company, or the PMO, or the HR people to sign-off, just in case the people you worked for are not there. This enables you to get some proof of your experience for PMI. My designation is not Project Manager? Can I still apply?Even if your designation is not Project Manager, you can still apply, as long as you have project management responsibilities – like managing people, resources, timelines, meeting and delivering the requirements to the customers, and communicating with the stakeholders.Your designation may be Team Lead, Technical lead, Supervisor, or similar, but that is fine with PMI. You need to document your experience in each project, from the last 8 years. Some key points – do not key in time for multiple projects at the same time. Use only about 6-7 hours of work per day. Key in projects with a total hours of 4500 or more. You have to put down teh time spent in the key processes of each process group for each of the projects. So yes, it is a lengthy process, but if you work out some details in an Excel file or on a piece of paper, it should be relatively easy to key it all in. When do I pay the fees – before the audit or after the audit?After your application is approved, you need to pay the exam fees to PMI first. Upon receipt of the fees, your application may be selected for a random audit by the PMI.They will send you an email immediately upon paying the fees, if your application is selected for audit. So if you do not see any prompt after payment of the PMP exam fees, then your application has not been audited. Hope this helps. 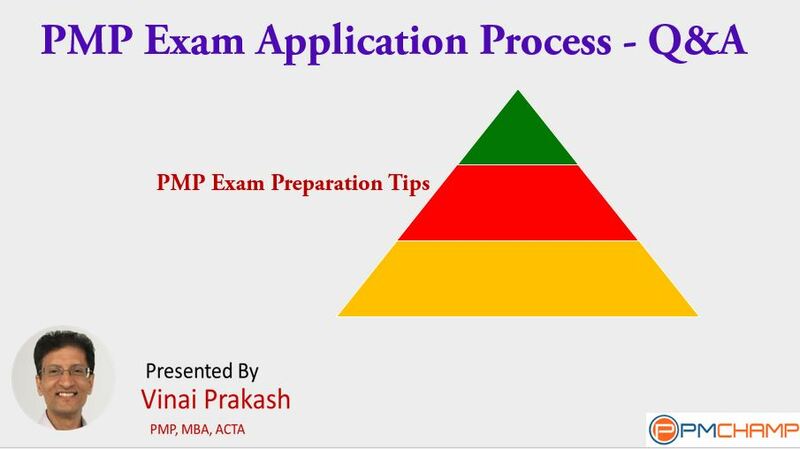 Let me know if you have any other questions related to the PMP Exam Application process, so that I can add them here for the benefit of you, and other PMP aspirants. Hi, Can i submit the application for approval, and after i get the approval i go and sign for membership so as to pay less for the exam? or the membership should be made before submitting the application? I have the same question as Jason too? Can I wait for approval , then take PMI membership and then pay the exam fees? Yes. Once your PMP application is approved by PMI, you can become a PMI member first, and then pay lesser fee for the PMP exam. Is this still works in 2015? If I understood correctly,if you are not memeber in time you sent application,PMI will send you nonmember fee? Yes. Once your application is approved, you can become a member first, and then pay lesser fee for the exam.